In the climate change arena, there are two main streams of work – mitigation, which are measures we need to take to stop emissions and halt climate change, and adaptation – the varied practices we are taking and can take to adapt to living with the new conditions that climate change brings. 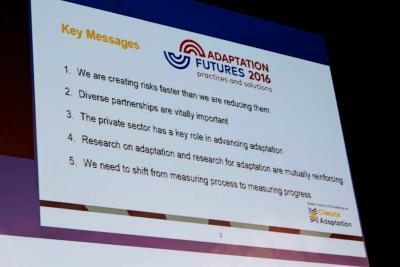 Adaptation Futures is concerned with the latter and is the biennial conference of the Global Programme of Research on Climate Change Vulnerability, Impacts and Adaptation (PROVIA). The 5th international Climate Change Adaptation conference was held in Cape Town in June 2018. As the name implies, it focused on adaptation. The African Centre for Biodiversity (ACB) participated in the conference together with the Surplus People Project (SPP) and Bread for the World. We shared our hour-long session with Griffith University (Australia) to explore the topic “Harnessing indigenous and traditional knowledge for adaptation in low-input conditions”. First, let me get off my chest that the prohibitive cost of participating in this event and the opening/welcoming plenary consisting of 5 men and only 2 women disturbed me from the outset. There was no hiding the fact that a particular exclusive class of humans would be discussing the fate of the world on their terms and speaking and thinking on behalf of marginalised and vulnerable communities. I feared that the well-worn narratives about technology as a (so-called politically neutral) saviour and the commercialisation of “green” incentives would underpin the agenda and the dialogues, while providing a platform for the green industry to sell their ideas. In all honesty I can’t tell you if that was a fair intuition, given that just on the day that I attended, there were 55 presentations to choose from, covering an extensive range of issues from all over the world by a wide variety of stakeholders. Adaptation is a mind-bogglingly vast topic. I attended a session on “an urban equity and justice orientation for climate adaptation and resilient transformations” hosted by Birmingham University (in a nutshell equity and justice are ranked low as outcomes of adaptation interventions). I also attended a session on Community-Based Organisations’ (CBOs’) engagement regarding adaptation in their grass root work. There is plenty of innovative and inspiring work happening at grass roots, although it became clear that the high-level politics regarding this work is fraught and the negligible budget to finance such projects shows that they are low priority. I did not attend CGIAR’s session on “transforming agri-food systems – moving from science to action” and I noticed that the corporate-driven, purposefully ambiguous and greenwashed concept of climate smart agriculture remains the dominant and undisputed approach toward agriculture and climate change. So – a very mixed bag, and there can be no doubt that the Cape Town International Conference Centre was full of passionate and interesting individuals and institutions working on adaptation and an incredible amount of new and interesting knowledge and research was being presented and debated over the week. However, information is just one side of the climate change equation; without discussions on values, worldviews, the imperative for economic growth, and who holds power, the discussion is incomplete. Leswin Koopman, who is a smallholder farmer from the Northern Cape of South Africa and a member of the Food Sovereignty for Agrarian Reform movement, shared a ‘slice of life story’ of his farming practice. What struck me, sitting in this high-level meeting crammed full of donors, development agencies, NGOs, scientists and corporates, is that no saviour is going to come to these communities and protect them from climate change and increasing desertification in that already harsh environment. Instead, Leswin has learnt about how to cultivate and use the indigenous and hardy rooibos (redbush) plant from a local elder. He incorporated this knowledge into his own mixed agricultural production system comprising of a variety of crops and livestock and shares that knowledge and exchanges seed with other local community groups. His agricultural resource and knowledge base is enriched by interaction with local communities, as well as through interaction with SPP and the wider political and solidarity platform provided by Food Sovereignty for Agrarian Reform, which is linked to the global peasant movement, La Via Campesina. Thus he is adapting to changes in his local conditions with his own ingenuity and the help of local knowledge on indigenous resources. He is supported by a variety of networks and movements that value sovereignty, local knowledge, environmental integrity and care for one another. He is hampered by the fact that rooibos has become a lucrative commodity and he must therefore compete with large-scale commercial farmers and distributors. In this ecology he must supply the middleman instead of having a direct market, and the prices he can fetch are unfair. This is not a technological issue, but a political one and should be a crucial discussion in the adaptation discourse at the global level. However, rooibos is not his sole livelihood and sustenance activity; his story proves that the key to adaptation and resilience is diversity – diffusing risk by engaging in a variety of activities and social networks gives him the ability to be nimble and adaptable. After Leswin’s presentation I presented on new legal regimes regarding seed on the African continent that actively destroy resilience and diversity, creating instead intense vulnerability in the face of climate change. The narrative used to sell these new seed policies posits traditional knowledge and indigenous resources as “backward” and inefficient and even goes so far as to blame hunger on the continent on farmer-managed seed. Even though some 80% of the food produced in Africa comes from smallholders, and even though this food is produced primarily from farm-saved seed, the global seed industry proposes to replace farmer-managed seed – wholesale – with their anaemic portfolio of crops and varieties. While farmer-managed seed comprises a diverse abundance of crops and varieties that provide nutrition, medicine, fodder, fibre and livelihoods, the formal seed industry focuses on a handful of commercially viable crops, such as maize and legumes. What’s worse is that this seed must be genetically uniform to gain certification for marketing, which further narrows diversity and the adaptability of this seed. The formal industry has a preference for promoting and selling hybrid seed, which performs reliably for only one season, after which its viability and yield dramatically decreases. This necessitates the annual purchase of seed. The Plant Variety Protection (PVP) regimes that are being aggressively pushed at national and regional levels also make this seed the intellectual property of the breeders, thus prohibiting recycling and sharing of protected seed. The upshot of seed trade laws, coupled with PVP laws, is that formal, privatised seed is the only seed that is allowed on the market, while in some cases farmers’ varieties and vital traditional agricultural practices such as sharing seed are stamped out or criminalised. The seed industry knows full well that they are unable to provide the wide diversity of seed that African farmers, households and communities need for their survival and wellbeing, but they’re willing to sacrifice farmer-managed seed systems in order to corner the market and assure their profits. Our governments are going along with this nefarious plan, enacting these draconian laws, even buying “improved” seed with the public purse and distributing this seed to farmers on behalf of seed companies, thereby wiping out farmer varieties and agricultural know-how. This is the antithesis of adaptation for climate change, destroying diversity and resilience and creating farmer dependency on corporations and uncertain markets. I left the conference feeling frustrated by all the noise around the issue and with the distinct feeling that we are not asking the right questions in order to deal with this situation that threatens the very life-support system of all life on earth. We need to be deeply critical of modern technological methods to adapt to climate change if they emerge from elite research agendas to suit commercial needs. Technology always comes with owners and intellectual property rights define who has access and under what conditions the technology may be used. Elite research agendas and intellectual property regimes shape development paths and our ideas about modernity, all the while deepening the global class and power divide. Further, global economic and intellectual property regimes are built on the notion of individual actualisation and individual rights, which are not universal values. Other worldviews are actively oppressed or radically changed to fit into the individualistic worldview, if they are acknowledged at all. This perverts functional worldviews and cultural practices. Struggles around indigenous knowledge are not only about the actual knowledge itself and who can benefit commercially from it, but also about the definition of modernity and the acknowledgement of varied knowledges and worldviews as credible and equal to the worldview of the globe’s elite and powerful. Misguided and frankly racist terms such as “under-developed” and “backward” are surprisingly common and accepted in mainstream discourse. I hope for a time when naked profiteering and commercialisation and associated extraction and exploitation are recognised as backward and uncivilised. While I deeply value research and information about how we can adapt to the climate crisis that has already hit us, I would love to see a greater critique of the value system that brought us to this brink playing a central role in high-level dialogues such as these. Unfortunately the elite talking to themselves are unlikely to unseat themselves from their comfortable positions by addressing the heart of the issue.